The next control in the basic toolkit is the menu. Menus are much like a series of nested buttons in the way you deal with them. Let’s create a simple menu. I’ve added a DockPanel, so we could nest our menu at the top, a very common scenario. The underscore acts as an indicator to underline in the menu, designating a “hot key”. 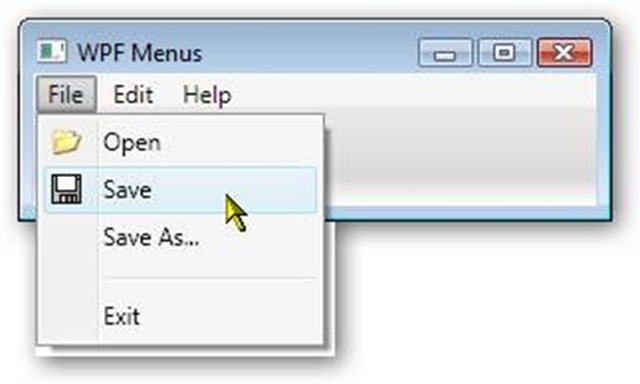 When the user hits the ALT key, they are then able to combine with the hot key to activate the menu option. 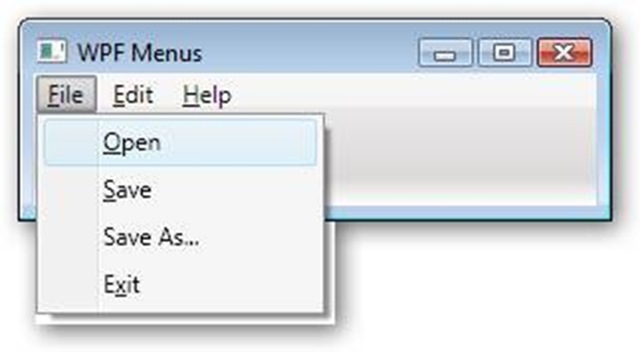 ALT+F opens the File menu, O will then trigger the open. Since all the other menus work the same way I won’t bother to wire them up, but you get the idea. It’s also possible to insert a separator, a visual line the separates one menu option from the rest. In this example, I think Exit should be separated from the other options. OK, I can hear you now, “Hey, this is WPF, what about all the pretty pictures?” No problem, the menus support the addition of icons to each item. One thing I’ve found many developers don’t realize is that Visual Studio actually ships with a nice array of graphics for your use. If you are using Visual Studio 2005, navigate to the C:\Program Files\Microsoft Visual Studio 8\Common7\VS2005ImageLibrary folder. There you will find a zip file named VS2005ImageLibrary.zip. I extracted the icons folders to my D drive, as you’ll notice in the next code snippet. Adjust the sample according to where you decide to put them. I did find that on Vista, I needed to move them out of my Program Files folder or they didn’t render correctly, a security permissions issue. For the MenuItems I wanted to add icons to, I need to define the MenuItem.Icon tag, then inside place an Image. The Source property I set to files I’d mentioned earlier. Note also I explicitly set the Height and Width to 16×16, in order to make them fit nicely into the menu. However, you are free to make them any size you wish, the menu item height will adjust automatically to compensate. Ah, a work of art even Leonardo da Vinci would be proud of. But our artistic menus are not limited to the the top of the Window. It’s also possible to attach a menu to nearly any control, in the form of a ContextMenu. ContextMenus appear when you Right Click with the mouse on the control. 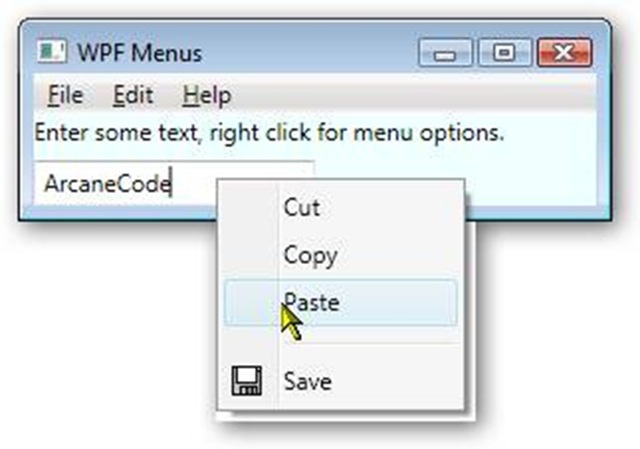 Enter some text, right click for menu options. To get this to work, I first had to create a ContextMenu tag specific for the control, in this case TextBox.ContextMenu. Within that tag I was then able to place my ContextMenu. Inside it I treated it just like a normal Menu control, the code in there I simply copied from the other menus. I could even have the Click events route to the same code in the code behind module if I wished. It’s worth pointing out that a menu may appear anywhere on the Window. Here I will create a menu to the right of the TextBox, in the next column of the Grid. The menu code is the same as before, except I located in the Grid instead of at the top of the Window. Virtually any application of decent size will need to employ a menu structure of some kind. 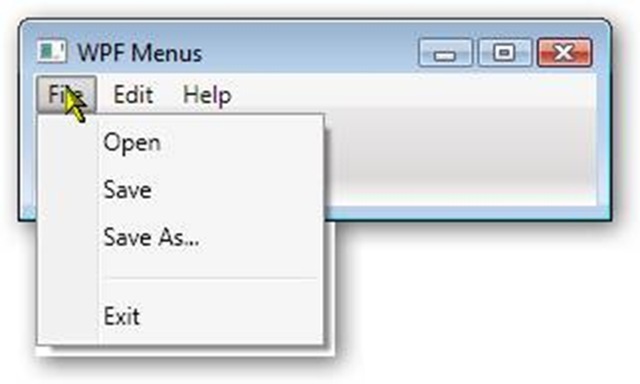 Getting to know the basics of menu controls will get you ready for that first big WPF app. How to change color for menus ? when the menu is clicked, the color will remain same.